Apartment 3 is fully booked for the winter season 2018/19! The apartment is located on the ground floor and provides a direct access to the garden. It is furnished in a very cozy Tyrolean style. It disposes of satellite TV and Internet access. 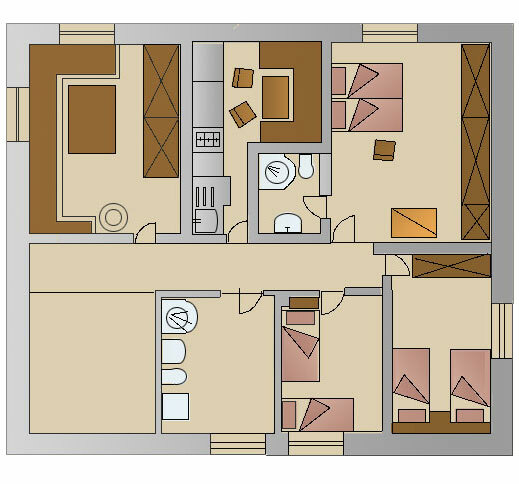 The Apartment 03 has three bedrooms: a double bedroom, a twin bedroom and a room with a bunk bed. 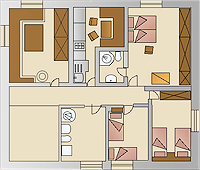 The rooms are all completely refurbished and offer space and sleeping comfort for your relax holidays in Val Gardena. You have two bathrooms with shower and/or bathtub and hairdryers. In the spacious bathroom there is a washing machine. The modern, well-equipped kitchen has a dishwasher, a stove with oven and a large fridge. A free-to-use parking place in the garage is included in the price. In the winter we rent the apartment only over the entire season.